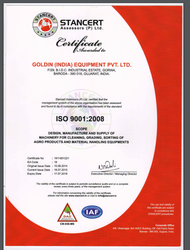 Established in the year 1991, we Goldin India Equipments Pvt. Ltd., is considered one of the leading Manufacturer and Exporter of wide range Cleaning, Grading and Separation Machinery. Our products range includes Clean-O-Graders Machine, Automatic Chilly Cleaning & Grinding Plant, Chain Conveyor, Rice Destoner, Seed Cleaner Machine, Seeds Cleaning & Grading Machine, Groundnut Cleaning Machine, Pulses Grading Machine, Vacuum Type Destoner, Impact Hullers, Liquid Screen Separator, Belt Conveyors, Screw Conveyors, Redler Chain Conveyors, Bucket Elevators, Inclined Belt Conveyor, Rotary Drum Sieve, Seed Cleaning & Grading Plant, Chilly Cleaner Machine, Hull Separator And Air Classifier. All our products combine efficiency, quietness, and quality with unrivaled ease of use. Developed using the influx technology, our range is fabricated from the quality raw material that is procured from the reliable vendors of the industries. With a rich industrial experience and a state of art manufacturing facility, we bring out an exclusive range of industrial machinery & equipment. With durability and high functionality, these equipment are widely used in engineering as well as agricultural sectors. We also undertake complete job works starting from planning to equipment's designing, construction, installation & commissioning. All the products are driven by international technology which is sourced from internationally reputed company FORSBERGS Inc., USA. We have all the resources and facilities to offer customized solutions for our range of equipment. Further, all our standard, as well as customized equipment, are designed/developed to suit the diversified atmospheric conditions in India.With its dedicated team of skilled professional and single-minded determination of Mr. M. D. Patel, our organization aims to add more stars to its success story. Further, he has been continuously motivating his professionals to work in close association, which has gained us a huge success. As we believe in quality driven principles, we provide qualitative products to our clients. In order to ensure the quality, we conduct various tests and verifications starting from the beginning until the end of the production process. All the testing activities are undertaken under the supervision of quality controlling inspectors who leave no minute dark spot while checking the products. Moreover, it is also checked that all the products offer optimum performance at the client's end. Since ours is a customer-centric organization, we pay utmost care for the quality of the products which are manufactured at our site. Using superior quality raw materials and advanced technologies, we develop our product range which ensures in quality, shelf life and operational performance of the products. Further, we assure that each & every product provides fast processing and accurate result at the clients’ site which enables us in gaining maximum customer satisfaction. With an experience of almost four decades, we, Goldin (India) Equipment have well established ourselves in the worldwide market. Our dexterous team is the backbone of our organization whose rigorous effort and constant credibility enhance the goodwill of our company. We have employed teams of experienced professionals and staffs having profound knowledge and skilled instinct which help us in offering exclusive range of products. Further, our team of quality controllers ensure that all the products are suitable for users’ requirements.